Sarah Dawn's Designs: Classes and Finished Things! I know it's been a while. I'm seriously trying to get better about this whole bloging thing. But right now, this is not my day job (though one day that would be amazing), and my day job (I work for a Library Association), is super busy right now. Hence, no blog. So, my apologies. Anyway, though, I wanted to share something kind of awesome. I'm going to a knitting class tonight! Kate Atherley is teaching a class on patten design at my LYS, and I'm going to be there tonight. I've already bought her book (which is a blessing and very, very useful! ), and now I get to talk to her in person and ask my zillions of questions. It's actually quite exciting! On an even more exciting note, I've finished two new prototypes, and I'm now going through the layout and modelling process to get the patterns actually written. 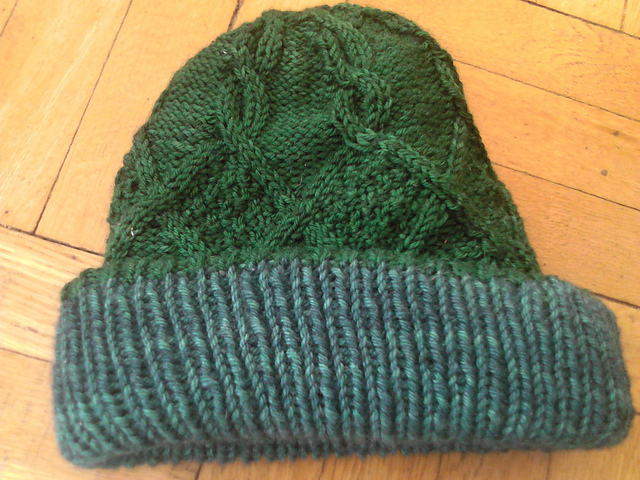 I've finished the Woodland Hat! I'm now going through the process with my wonderful layout designer to try and get this pattern actually onto (digital) paper, and get some modeled photographs. Then it will go out to test-knitters (if you'd like to test-knit, watch this space, since I'll be calling for test-knitters via Ravelry)! The second is what I'm tentatively calling the Smuggler's Cove Scarf. It was a requested design from a friend of mine for Christmas, and I just finished it up last week. (Yes, Christmas presents happen in February sometimes. I try not to, but hey, it happens). I don't have any good pictures of it yet, but my gift-ee has consented to allow me to borrow it back to get good modeled photographs. I thought about keeping it until I could get it modeled, but I figured I'd already kept her waiting two months, so that just didn't seem fair! Anyway, I'm hoping to update this space more, so stay tuned here!